The Diamondback Recoil 29er is a simple, great and highly functional complete mountain bike. This is the best Diamondback mountain bike out there on the market in its segment and will help you to ride the bike in the rough road and terrain with extreme ease. If you think budget bikes are not good for mountains biking then you are wrong with this Diamondback Recoil bike. This is a budget mountain bike but its performance is mind blowing! When you ride this, its incredible functions and easy features will never make you think that you are riding a low budget mountain bike. To clear any kind of confusion on this Diamondback Recoil mountain bike, here we have added an extensive best Diamondback mountain bike review. The Recoil 29er mountain bike is equipped with some great components and features, such as a single-pivot design, sealed bearing cartridge, suspension travel of 4-inch, a 6061 T6 aluminum frame, and 29 inches wheels. When all of these Diamondback Mountain bike parts and components, you get durable performance, smooth ride, light weight, simple maneuverability, and pleasant riding. So if you are looking for a long lasting rough and tough mountain bike that can overcome roots, rocks, and bumps with ease, then this bike is just perfect for you. For more information on the Recoil mountain bike, read on this review. The Diamondback Recoil mountain bike comes with plenty of specs and features that make the mountain biking more enjoyable to you. Below read the details information about the Recoil mountain bike features. In the case of gearing and shifting components, Diamondback uses Shimano equipment for this bike. The Shimano gearing components that are used on this bike are, a Shimano 8-speed drivetrain, an Altus dual-pull Shimano front derailleur, an Acera 8-speed Shimano rear derailleur, and for consistent gear shifting an SR Suntourcrankset. All of these bike components result in smooth, reliable and responsive gear shifting action, in all types’ terrains and in all kind conditions. The brake is one of the most important parts of a mountain bike. Good braking components are required for ultimate safety. In this case, the Recoil has mechanical disc brakes of Tektro Aires. This Tektro Aires mountain bike works in all weather conditions. So when you are riding the bike at a high speed, this mechanical disc brake will cover you all the times. All over the Recoil Mountain Bike the alloy is shining. You will see alloy components everywhere in this bike, like handlebars, pedals, a seat post, a stem, and rims. The alloy is basically used to make the bike light weight. Light weightiness is greatly desired for the best mountain bike for handling and fun riding. These alloy bike parts work together to give you the possible lightest bike weight while ensuring power, strength and precision are maintained throughout. 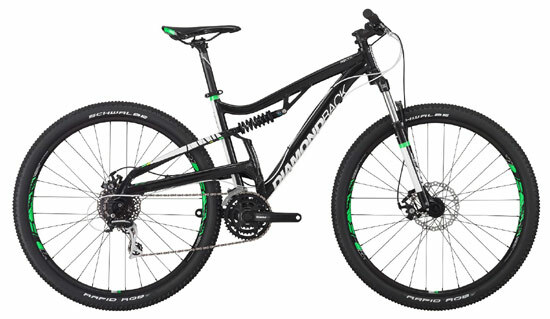 The bike frame and suspension is extremely important for a mountain bike, and thankfully, like the Diamondback response mountain bike, the Diamondback Recoil 29er mountain bike is also equipped with top notch quality mountain bike frame and suspension. This 29er has a hand built 6061-T6 lightweight aluminum frame, and a 100 mm travel SR Suntour XCT suspension fork. Because of this full suspension machine, it tackles rough trails easily riddled with rocks, deep mud, roots, logs, steep declines, boulders, and streams. There is also a Kindshock shock absorber that absorbs almost all jolts while riding on a bumpy road or in the rough terrain. The large 29-inch wheels support the suspension and fork to overcome different obstacle without resistance, making for a great and pleasant ride. 1.What type of brake is used on this bike? The mechanical disc brake is used on this bike. This brake works really well with this bike and is good enough for the 24 speeds drivetrain. 2.Is the bike is assembled when shipped? No, this bike is not assembled when shipped. However, assembling of this bike is easy and simple. You can assemble it by yourself. Assembling instruction is provided with the package. 3.What is the weight of this bike? The weight of this bike is about 36.5 lbs. 4.Is this bike is reliable? Most of the Diamondback mountain bike reviews say, this bike is quite reliable. Diamondback has used the possible best quality material for this bike. Finally, we can say the Recoil is a great bike for both beginner and professional riders, and you can also use this bike for both mountain biking and casual riding purposes. With its quality build, lightweight body and frame, large wheels, durable components and smooth suspension, this Diamondback Recoil 29er mountain bike will give you pleasant ride in rockiest of trails with complete ease. I can tell you that it is one the best diamondback mountain bike recently. However, the bike has some drawbacks but at the end, it manages to give a memorable riding experience to every entry level mountain bike rider.